In our June issue, on newsstands now, we take a look at a restored Schindler house, which sat all but forgotten in Inglewood until it was rediscovered by architect Steve Ehrlich. This past April, an eager crowd of more than 150 architects and other fans of Rudolph Schindler got a chance denied to all but graffiti taggers for the last dozen or so years—to gaze into the midcentury modernist’s only church. 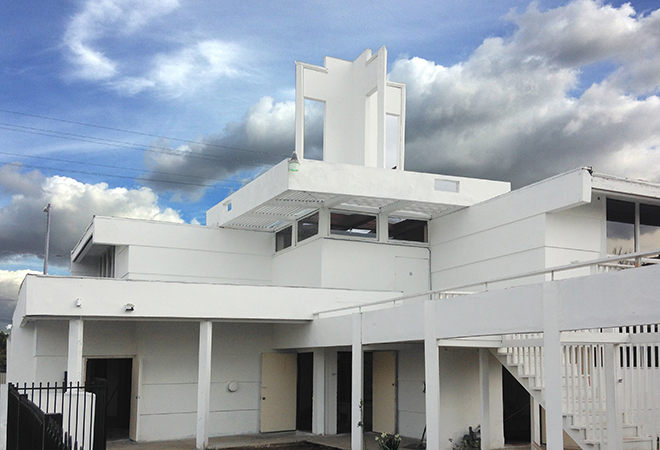 How Schindler came to design a house of worship for the Bethlehem Baptist Church of South L.A. remains a mystery. 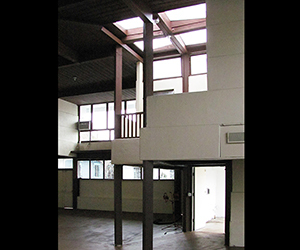 What’s known is that the building was completed in 1944, an L-shaped design wrapping around a courtyard that’s in keeping with previous homes Schindler created. The airy main hall rises to a central tower crowned by a cross and was sited to make a dramatic impact as parishioners approached along Compton Avenue. Photos taken by Julius Shulman in 1949 show a large diamond-shaped altar with a baptismal pool to the rear (sometime along the way the altar was carved up to add a ramp in front). San Diego architect Steve Wallet, who’s among a cadre of Schindler aficionados poised to aid in the restoration, believes the church was painted mulberry gray, rosy violet, and deep plum, Schindler’s way of honoring the skin tones of the African American congregation. For the first time Schindler also mass-produced striking tongue-in-groove Douglas fir boards to cover the large ceiling area, an idea that proved not only inexpensive but one he would implement in other projects. The original chandeliers, not surprisingly, were long gone. But Schindler follower Brendan Ravenhill, an L.A. lighting designer, stepped in to produce two fitting fixtures. Over time the church leadership split and the building came up for sale—only to have its buyer disappear into the mists. Upon foreclosure the church was put up for sale, just as Pastor Ashley was looking for a larger site for his growing Watts congregation at Faith Build International (or FBI, as he likes to joke). Ashley is currently leasing the building after ponying up $50,000 for painting and other necessary repairs. Now his flock meets at 11 a.m. each Sunday in one of the most treasured churches in America. As the sellers decide on a final purchase price, Wallet and other friends of the church wait. That there’s finally an occupant is a huge step toward guaranteeing that the building will remain intact and that fund-raising and restoration can move forward. As for Ashley, he’s grateful each day for his find, though he knew nothing about Schindler before stumbling on the site. “That Schindler would have faced the racial tension of the time and still put his time and money into the place makes him special to me,” the pastor says of his new home’s famous creator.